The Magic Circle Nature Playground is a transformation in outdoor learning at the Parent-Infant Center (PIC). When PIC set out to revitalize its main playground, we chose to make more than mere improvements. 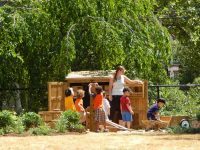 Our vision was to connect children living in the urban neighborhood of West Philadelphia with the natural world by providing unstructured, nature play with endless opportunities for exploration and discovery. Reaching beyond the children enrolled in our early learning classrooms, the playground is also shared with families in our community. In 2010, we devised a conceptual plan with the help of a grant and technical assistance from the Nature Explore program. Members of PIC’s Board of Directors and administration, along with a playground committee made up of staff and families, established a multi-phase implementation strategy. 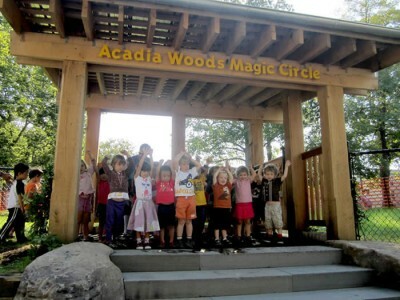 We broke ground in the summer of 2012 and began to transform our play space, which had been suffering from soil compaction, drainage issues, inhibited grass growth, and areas of severe overuse, into a nature playground, which we officially named Acadia Woods Magic Circle. A beautiful wooden arbor with vines growing up the sides serves as the entrance to the playground. This entry arbor invites children and their families to connect with nature through free and joyful play in a special, peaceful space. 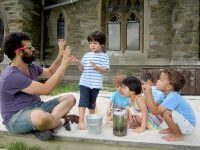 In the Magic Circle, PIC teachers encourage children to make meaningful connections with nature daily. Inspired by nature, children express themselves on an outdoor stage and through drawing and painting with natural materials. 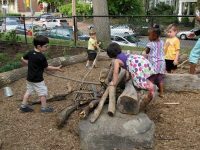 Children jump along tree stumps and climb on a wall of big boulders to enhance gross motor skills. A children’s garden provides a hands-on opportunity to learn about growing healthy foods. Our messy materials area offers branches and sticks of varied sizes to spark imaginations. The space also features a “log of interest,” which is specially designed for children to observe water as it flows through a channel carved into the log. Children dig deep holes and rivers in the dirt digging area and gear up in rain boots to jump in puddles, squish dirt through their fingers, and cook in the mud kitchen. There are also open areas for running and playing games. We also took measures to help sustain this beautiful space. With a history of poor drainage after heavy rains, we re-graded areas of the playground to direct storm water runoff and prevent erosion. 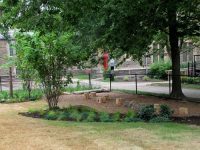 We included a rain garden with carefully selected plants and special soil. PIC is grateful to its families, alumni and friends whose incredible generosity and countless volunteer hours allowed us to begin work on our learning areas. We thank The Children’s Hospital of Philadelphia (CHOP), a valued community partner and fellow advocate for child health and wellness, for its grant in support of this initiative. The grant from CHOP was matched by Rebecca and Arthur Samberg, good friends of PIC who have provided generous support through the years. We are also deeply grateful to the Germeshausen Foundation, which also significantly supported this ambitious project. In addition, we received substantial in-kind support from The Woodlands, ThinkGreen, LRSLAstudio, and Pennoni Associates.